f0 = pitch(audioIn,fs) returns estimates of the fundamental frequency over time for the audio input, audioIn, with sample rate fs. Columns of the input are treated as individual channels. f0 = pitch(audioIn,fs,Name,Value) specifies options using one or more Name,Value pair arguments. [f0,loc] = pitch(___) returns the locations, loc, associated with fundamental frequency estimates. Read in an audio file and then call the pitch function with default parameters. Plot the audio signal and pitch contour. The pitch function estimates the fundamental frequency of the input signal at locations determined by the WindowLength and OverlapLength name-value pairs. Load an audio file of the introduction to Für Elise and the sample rate of the audio. Call the pitch function using the pitch estimate filter (PEF), a search range from 50 Hz to 800 Hz, a window length of 80 ms, and an overlap of 50 ms. Plot the results and listen to the song to verify the fundamental frequency estimates returned by the pitch function. The different methods of estimating pitch provide trade-offs in terms of noise robustness, accuracy, optimal lag, and computation expense. In this example, you compare the performance of different pitch detection algorithms in terms of gross pitch error (GPE) and computation time under different noise conditions. Load an audio file and determine the number of samples it has. Also load the true pitch corresponding to the audio file. The true pitch was determined as an average of several third-party algorithms on the clean speech file. Create test signals by adding noise to the audio signal at given SNRs. The mixSNR function is a convenience function local to this example, which takes a signal, noise, and requested SNR and returns a noisy signal at the request SNR. Save the noise conditions and algorithm names as cell arrays for labeling and indexing. Preallocate arrays to hold pitch decisions for each algorithm and noise condition pair, and the timing information. In a loop, call the pitch function on each combination of algorithm and noise condition. Each algorithm has an optimal window length associated with it. In this example, for simplicity, you use the default window length for all algorithms. Use a 3-element median filter to smooth the pitch decisions. Gross pitch error (GPE) is a popular metric when comparing pitch detection algorithms. GPE is defined as the proportion of pitch decisions for which the relative error is higher than a given threshold, traditionally 20% in speech studies. Calculate the GPE and print it to the Command Window. 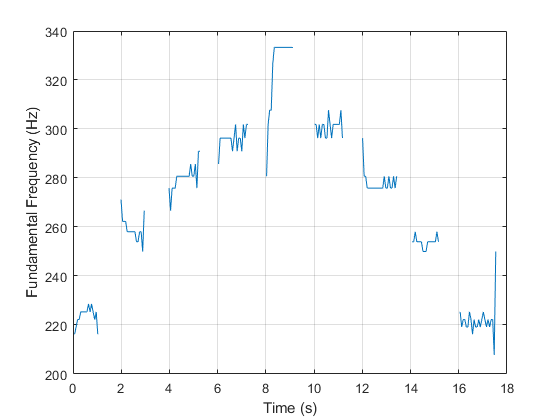 GPE (p = 0.20), Noise = Turbine (20 dB). GPE (p = 0.20), Noise = Turbine (0 dB). GPE (p = 0.20), Noise = WhiteNoise (20 dB). 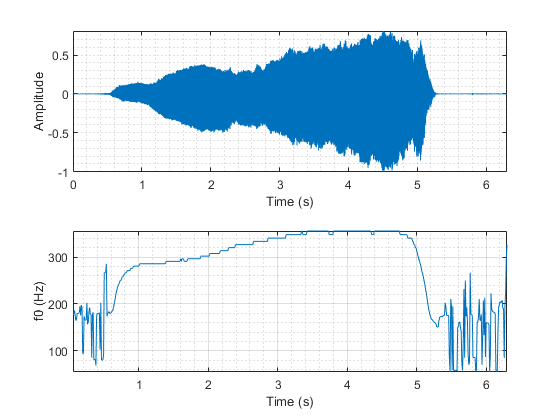 GPE (p = 0.20), Noise = WhiteNoise (0 dB). 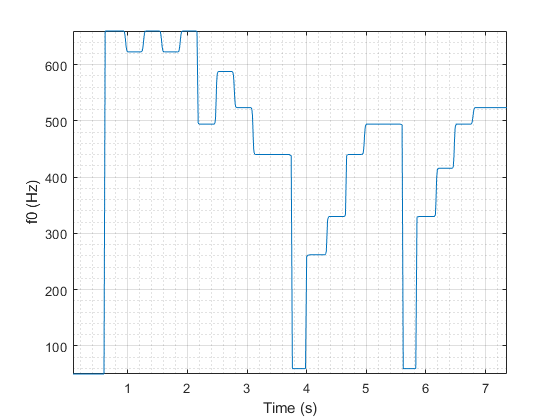 Calculate the average time it takes to process one second of data for each of the algorithms and print the results. Audio input signal, specified as a vector or matrix. The columns of the matrix are treated as individual audio channels. The sample rate must be greater than or equal to twice the upper bound of the search range. Specify the search range using the Range name-value pair. Search range for pitch estimates, specified as the comma-separated pair consisting of 'Range' and a two-element row vector with increasing positive integer values. The function searches for a best estimate of the fundamental frequency within the upper and lower band edges specified by the vector, according to the algorithm specified by Method. The range is inclusive and units are in Hz. Number of samples in the analysis window, specified as the comma-separated pair consisting of 'WindowLength' and an integer in the range [1, min(size(audioIn,1), 192000)]. Typical analysis windows are in the range 20–100 ms. The default window length is 52 ms. Number of samples of overlap between adjacent analysis windows, specified as the comma-separated pair consisting of 'OverlapLength' and an integer in the range (-inf,WindowLength). A negative overlap length indicates non-overlapping analysis windows. 'PEF' –– Pitch Estimation Filter . The function does not use the amplitude compression described by the paper. Median filter length used to smooth pitch estimates over time, specified as the comma-separated pair consisting of 'MedianFilterLength' and a positive integer. The default, 1, corresponds to no median filtering. Median filtering is a postprocessing technique used to remove outliers while estimating pitch. The function uses movmedian after estimating the pitch using the specified Method. Estimated fundamental frequency, in Hz, returned as a scalar, vector, or matrix. The number of rows returned depends on the values of the WindowLength and OverlapLength name-value pairs, and on the input signal size. The number of columns (channels) returned depends on the number of columns of the input signal size. Locations associated with fundamental frequency estimations, returned as a scalar, vector, or matrix the same size as f0. Fundamental frequency is estimated locally over a region of WindowLength samples. The values of loc correspond to the most recent sample (largest sample number) used to estimate fundamental frequency. The pitch function segments the audio input according to the WindowLength and OverlapLength arguments. The fundamental frequency is estimated for each frame. The locations output, loc contains the most recent samples (largest sample numbers) of the corresponding frame. Atal, B.S. "Automatic Speaker Recognition Based on Pitch Contours." The Journal of the Acoustical Society of America. Vol. 52, No. 6B, 1972, pp. 1687–1697. Gonzalez, Sira, and Mike Brookes. "A Pitch Estimation Filter robust to high levels of noise (PEFAC)." 19th European Signal Processing Conference. Barcelona, 2011, pp. 451–455. Noll, Michael A. "Cepstrum Pitch Determination." The Journal of the Acoustical Society of America. Vol. 31, No. 2, 1967, pp. 293–309. Hermes, Dik J. "Measurement of Pitch by Subharmonic Summation." The Journal of the Acoustical Society of America. Vol. 83, No. 1, 1988, pp. 257–264. Drugman, Thomas, and Abeer Alwan. "Joint Robust Voicing Detection and Pitch Estimation Based on Residual Harmonics." Proceedings of the Annual Conference of the International Speech Communication Association, INTERSPEECH. 2011, pp. 1973–1976.